Hmmm, I never thought about it like that before. Pretty much all the books with the University faculty are commentary on the scientific and academic establishment... the students always building something in the squash court and the senior members ignoring them and eating big dinners. It's hard to rank them but Thief of Time is definitely my all time favorite, the concept of real Death by Chocolate is ace! There are a couple of Discworld topics perhaps there should just be an all emcompassing for discussion I figured I'd bump this one for my post. Anyway while on Vacation I took some discworld with me (and bought the zombie survival guide while I was on the road) Anyway i grabbed Colour of Magic, Wryd Sisters and Night watch. Night watch blew me away I couldn't put that one down. I'm going to read the rest of the watch stories now on that I almost wish I started at Guards Guards, In anycase I love Night watch. Colour of Magic wasn't anything special Wyrd Sisters was pretty good as well. Wyrd Sisters (and a few books either side of it) is about the point where Discworld transitions from just being a series of rather sloppy fantasy novel parodies to being more of its own animal. The colour of magic is indeed pretty naff, but I'm surprised you liked Night Watch without having read any of the other City Watch books. I suppose its not that bad because most of the cast of the book is new characters. Man. I have Good Omens lying around unread somewhere. I guess I should go read it. Good Omens is the only one that's elevated from the rest. I like most of the Discworl books. He's been sliding lately though, too much rehashing. Vimes is the favourite char though, imagine George Clooney or Hugh Laurie in that role! While Night Watch remains my favorite Discworld, I think Good Omens was better. 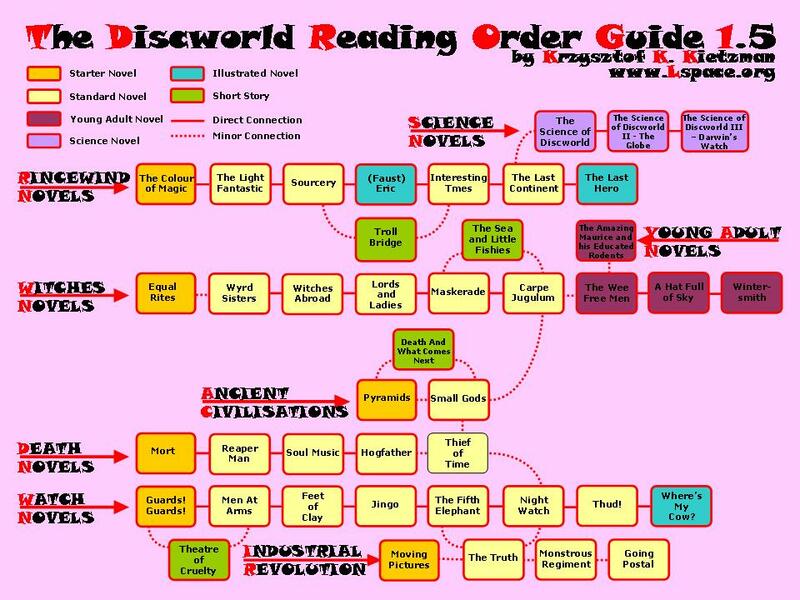 Is there any particular order I should read discworld in? Not really, but try to read the earlier ones first where the city watch or the witches are concerned. I read Mort first. I think it's a good starting point. Might actually be a good idea to start with the first ones so you can watch the series get dramatically better and the change in tone isn't too jarring.